This postcard has been in a safety deposit box for most of the last 70 years. I just hate for such an interesting piece go to waste by sitting in a box. I suspect it was sent to a friend of my father (who was 12 at the time and lived near this address in Washington, DC)...who gave it to him knowing that he collected stamps and post cards from around the world. My dad, who had this postcard in an old metal "cash box" for these many years...went off to war as Johnny did. He then flew in the USAF for 20 years...carrying all of his collectibles around the world with him many times...along the way. When he passed away in 1979...I kept his stuff for the last 30 years. It is dated July 26, 1936. It was cancelled with a special 11th Olympiad 1936 Berlin postmark, featuring two swastikas, overlapping a German "Reich" stamp. 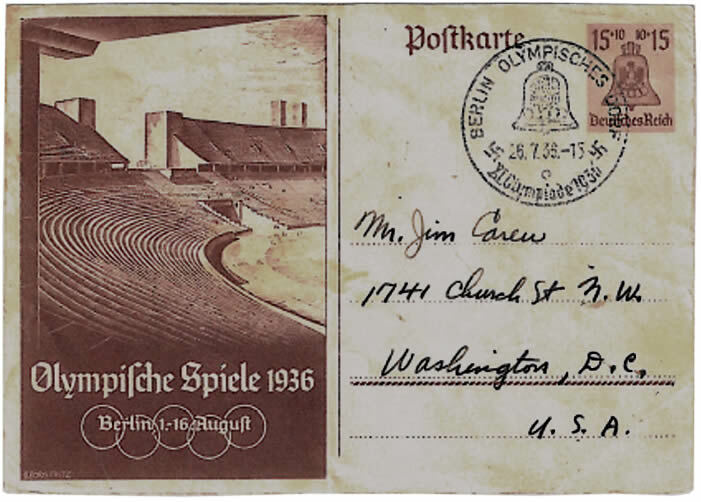 The postcard features an image of the Berlin Olympic Stadium with the words "Olympic Games 1936" in German along with "Berlin 1-16 August" and the Olympic rings. Germany is a nice country. We received a fine welcome upon our arrival in Hamburg and Berlin. Great ocean voyage. Had a fine time. Appetite good. Appreciate your radio-gram - showed it to Farrington. He + J think you are "aces." Berlin is some city. Beautiful buildings. Things so neat + clean. I am in good shape - race two weeks from to-day Joe McCluskey is my room-mate Take good care of yourself kid! 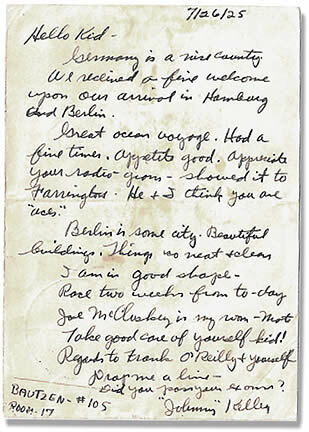 Regards to Frank O'Reilly + yourself. Drop me a line - Did you pass your exams? 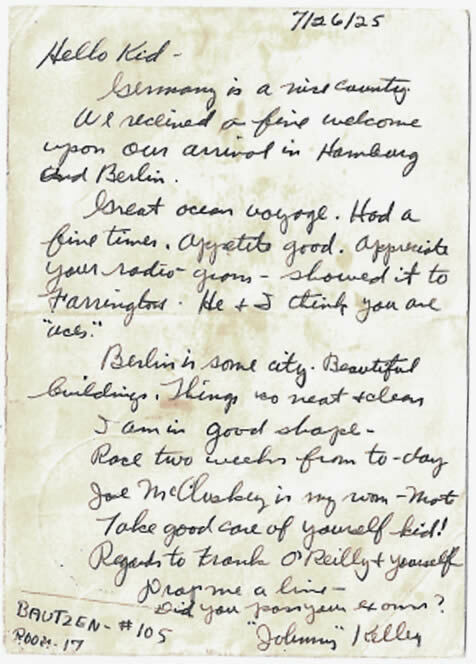 Courtesy of sharp-eyed collector Michael Bowlby, we have another card sent by Johnny from Berlin, written the day before the 1936 Olympic Marathon. It is dated and postmarked August 8, 1936. It was cancelled with a special 11th Olympiad 1936 Berlin postmark, featuring two swastikas, overlapping a German "Reich" stamp. 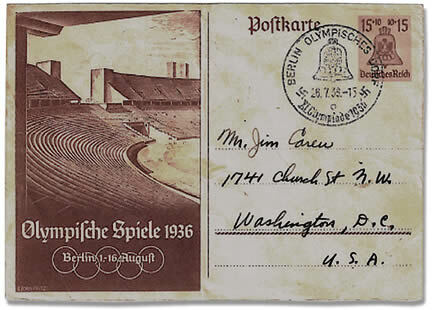 The postcard has a photo of the main entrance to the Reichs Sports Field in Berlin. Did you have a nice vacation? This is a fine experience being over here. Johnny's path to Berlin wasn't an easy one. He had won the Boston Marathon for the first time in April the year before, and he entered the Yonkers Marathon on Thanksgiving Day after having been told it was an Olympic Trial. It wasn't. 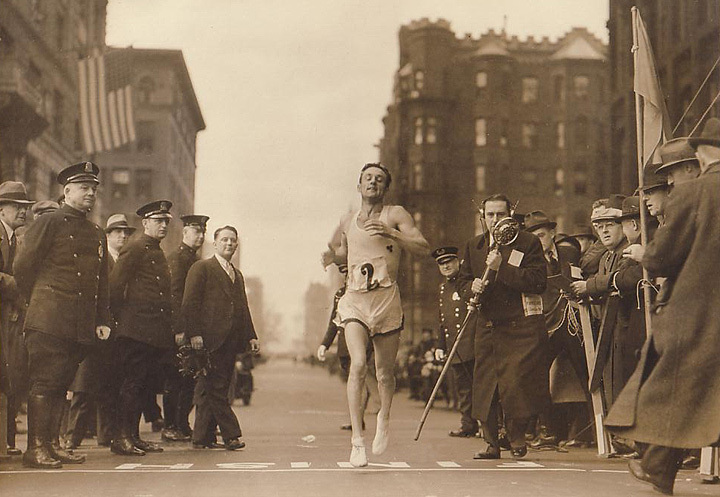 There would be two Olympic Trials for the Marathon, Boston of 1936 and a second a month later in Washington, D.C.
Johnny was the favorite in the 1936 Boston Marathon, but Tarzan Brown won, earning a spot on the Olympic team. Johnny finished fifth and had to run again in D.C., thirty days later. It would not surprise me if he stayed in Washington for this marathon with the recipient of the first postcard. Johnny finished second and was on his way to Berlin. During the seven day Atlantic voyage aboard the ship Manhattan Johnny met Jesse Owens. Jesse asked to try on John's custom made racing shoes and go for a jog arond the ship's deck...but his larger feet ripped the seams of the shoes and Johnny had to pay 50 cents to have them repaired. Johnny qualified for three US Olympic teams, in 1936, 1940 and 1948. Because of WWII there were no Olympic Games in 1940. In 1936 at Berlin Johnny finished 18th in the marathon, never really in contention, but he was the only American to finish. Less than three years later German tanks rolled into Czechoslovakia.